These words have been a guiding mantra, especially on days when uncertainty has crept in. I’ve realized that it’s perfectly normal to have those days. I’ve learned to ride through them and believe that tomorrow will be a better one. And I’ve come to understand that if you savor each part of the process and proceed with perseverance, faith and a lot of hard work, the rewards are truly great every step of the way. As yet another year dawns, I’m deeply grateful for this incredible journey with Community Heroes and Go Inspire Go. 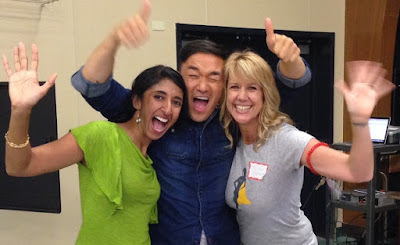 It all started as an experiment in 2012 as I was pondering how I could help shape my own kids’ perceptions of gratitude, compassion and service while living amidst the blessed abundance of Marin County, Calif. My serendipitous meeting with Toan Lam of Go Inspire Go that spring set off a series of events that has dramatically changed my course in life — personally, professionally and spiritually. Toan, aptly titled “Chief Inspirator,” has a real gift for seeing the potential and lighting a spark within people. He has helped me discover my own power — to be able to use my enthusiasm to empower kids and organize a program around kindness, compassion and action for families in my community. 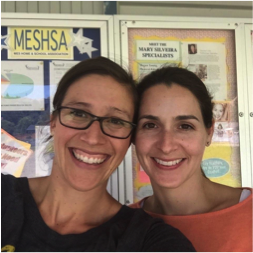 We launched Community Heroes at Sun Valley School in San Rafael, Calif., that year to test our theory that by getting kids excited about service by planting the seeds of compassion early, they would bear fruit in unexpected and delightful ways for years to come. Four years later, the program is still going strong at Sun Valley and has expanded to three other Marin County schools, led by passionate parents at Dixie, Mary Silveira and Vallecito elementary schools. As parents, we all share the desire to have our kids feel gratitude for all we have and compassion for those who have less. Making service fun and fulfilling is a key part of that formula. 1. A volunteer facilitator shows a Go Inspire Go video. 2. The kids are prompted to discuss how the featured hero’s story resonates with them. 3. 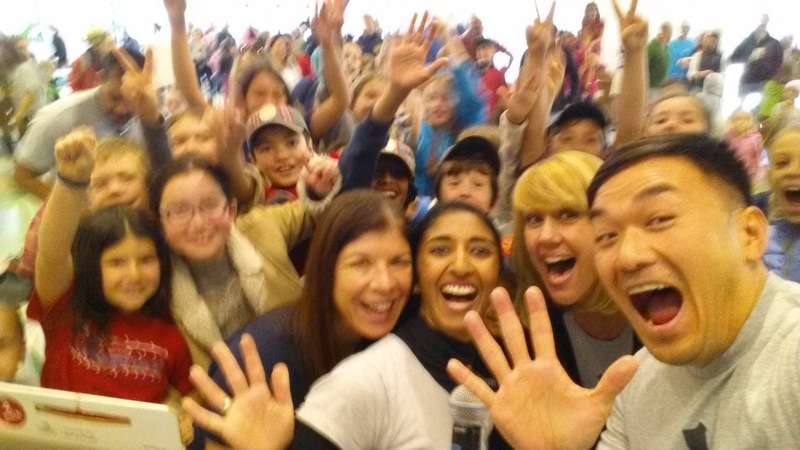 After sharing personal stories, the kids brainstorm ways they can help the cause locally. 4. The facilitator helps strategize and connect with the community to take action (organizing service activities accordingly). 5. We share the Community Heroes’ good works via Go Inspire Go’s social media platforms. Staying true to our ethos, “Small acts ripple out to meaningful changes,” we are brimming with inspiring, impactful highlights from this past year. We’ve presented our message to more than 2,500 Marin County students, with a platform promoting kindness, compassion and action. The impact is evident in tangible ways (service projects) and less “measurable” ways (kinder, more compassionate children who bring in their spare change and bake sale earnings to support earthquake victims, consider homeless people as “just like us” and who WANT to spend their free time helping their community). One day after I posed the question, “What can YOU do, big or small to be kinder?” one little girl approached me in all earnestness, saying, “I want to help lonely kids at lunchtime.” UNQUANTIFIABLE! We held kickoff meetings at Dixie Elementary and Mary Silveira Elementary in January and Vallecito Elementary in September. AWESOME, energetic parent leaders run the program, meeting with students weekly or every other week during lunch that have led to collection drives, bake sales and kindness acts around campus. We discuss issues that matter to the kids (homelessness, hunger, sick kids, animals and more) and brainstorm ways to take action. A sincere THANK YOU to our awesome ComHeroes moms (dads are welcome too! 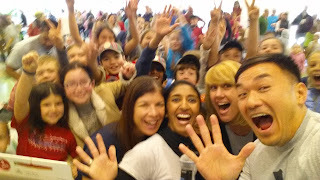 ): Atashi Chakravarty, Shannon Takaoka and Cari Friend at Dixie Elementary; Barb Snekkevik, Erin Rudsenske and Jennifer Harris-Marks at Mary Silveira Elementary and Amy Probst at Vallecito Elementary who have taken the helm at each of these schools and made this program their own! 4. Day of Giving: More than 250 participants took part in 12 service projects, including making 200 care kits for the homeless (Homeward Bound of Marin & Downtown Streets team), cooking an elegant meal for 36 Homeward Bound shelter residents and cleaning up Marin County parks and downtown streets. Big plans are underway for our 3rd Annual Day of Giving, coming up Sunday, March 6. More details on our most inspirational event of the year will be available soon. Dixie Elementary — Collected 65 bags of clothing, toys and toiletries for Lake County fire victims, raised $750 for UNICEF at Halloween, made special bookmarks for the Dixie library to encourage reading and made holiday cards for Homeward Bound and Casa Allegra Community Services. The club also started a Community Hero speaker series, including Dr. Alexandra Denino from the SF-Marin Food Bank who discussed the issue of food insecurity in Marin County. Mary Silveira Elementary — Has set up a wonderful blog to document their many activities, including creating giggle books for children in local hospitals, raising $350 through popsicle sales for Lake County fire victims and making beautiful ornaments for Homeward Bound and Whistlestop Wheels. 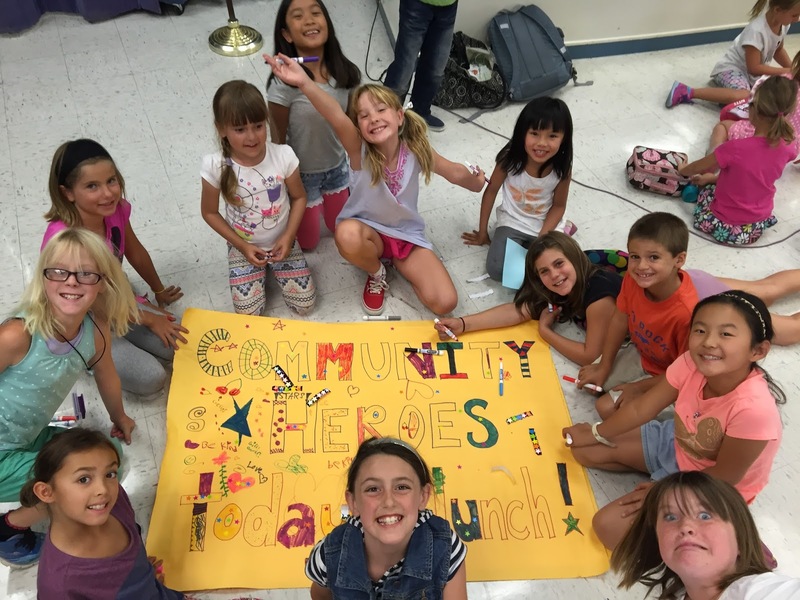 Vallecito Elementary — Our newest Community Heroes school is off to a roaring start! They have been meeting weekly since September. Students at Vallecito have decided to focus their compassion and philanthropic efforts towards their love of animals. They’ve invited the Humane Society to speak, after which students have been holding fundraisers to raise money for the organization. Students are also making efforts to improve animal habitats by preventing plastics from entering oceans and landfills by launching a student-run, school-wide marker recycling initiative with Terracycle. Vallecito students have also practiced community compassion by making holiday cards for Whistlestop's Meals on Wheels' homebound clients. Sun Valley School — Continued with tried-and-true activities such as adopting families for the holidays through Adopt a Family of Marin and collecting for the San Francisco Firefighters Toy Program. New activities this year included a Halloween costume drive for residents of Homeward Bound of Marin, collecting about 1,000 books for Lake County fire victims, and conducting earthquake relief bake sales and fundraisers for Nepal Youth Foundation. Testing and tweaking: Our friend and mentor Marin County Superintendent Mary Jane Burke advised us when we first met her a couple years ago. Grow small. Don't try to expand too quickly. Test and tweak. Try it out in a middle school, a high school. We took her advice and ran the program through our wonderfully enthusiastic teacher Melissa Stephens at Kent Middle School for a whole year and also shared our message with Terra Linda High’s AVID (Advancement Via Individual Determination) program students. These experiences showed us that in its current form (showing videos and doing group service work), our program construct is best suited for elementary school students, with parents facilitating. Our future plans are to tailor a flexible curriculum that students of any age, parents and teachers could use to inspire their own community projects. Approaching the Tipping Point: After years of testing, tweaking, experimenting, aspiring and inspiring for the past several years, we truly believe that 2016 is OUR year — the year of the tipping point. The year of breakthrough, and making compassion THE fashion. If you focus on the mainstream news, it’s easy to get downright discouraged with political rhetoric, global warming, refugee crises, Monsanto and the like. Instead of completely burying my head in the sand, I choose to keep asking myself and my Community Heroes, “What can YOU do to change your piece of the world?” Find YOUR inner hero. It’s in there….within all of us. If we all just focused more on THAT, the future is certainly bright. Warm wishes for a productive, fulfilling and service-driven year ahead.